The concentration analysis of liquid media is one of the most critical parameters for a proper process and quality control within the Chemical Industry. 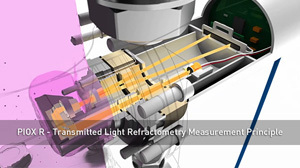 By measuring the refractive index, concentration levels of many media consumed or created within the chemical and textile fiber industry, such as solvents, acids, caustics as well as other - often corrosive and toxic - intermediate and end products, can accurately be monitored and a total quality control be assured. Both designs are highly durable against any corrosive and toxic media due to their internal FFKM gaskets, the media and scratch resistant sapphire optics as well as the complete separation of the sensorhead from the electronics compartment. For measuring toxic and corrosive organic as well as anorganic media, PIOX R is offered as a fully stainless steel design variant with all wetted materials made out of grade 316 Ti / 1.4571 steel. When dealing with highly corrosive media, such as hydrochloric, strong sulfuric or hydroflouric acid, PIOX R is also available as a special coal powder reinforced PTFE design variant offering an unrivalled corrosion resistance, long term stability and reliability in such harsh environments. Being ATEX Zone 0/1, 1 and 2 certified and available with long and short sensorheads that can be integrated into the process via DIN / ANSI flange or the proprietary FLEXIM flow cell, PIOX R is the ideal process analytical technology for a wide array of liquid media within the chemical industry.